I decided to use two of the shot cottons for the Bargello 9-Patch row to see if it could calm things down a bit. The tamale sacks used for this row are green print (spinach). This block was made using strip sets. Since I used the same fabric for all the blocks in this row, I constructed it by starting with longer strips. This was another case of making a half-block to fill the row. Working on a quilt that uses blocks patterns or fabrics you’ve used before can remind you of related quilts … like the lovely stack of Bargello 9-Patch blocks I won this year. I pulled them out of my bin of WIPS and UFOS and brought them into the studio so I can work on my quilt ideas … when other deadlines are met. Sophie, I’m loving how your sampler is turning out! 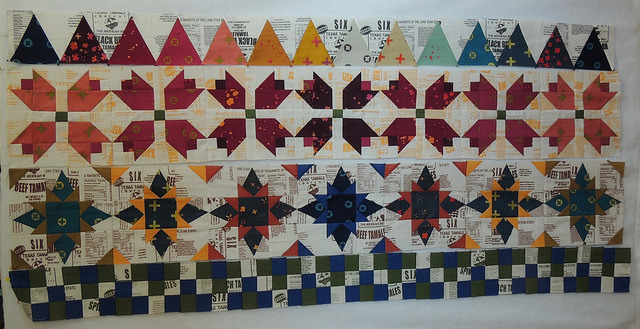 The tamale sack fabrics really make a huge difference and takes your blocks to a whole new level of interest! That is turning out so cool!!!! Now I really want to try one myself!!!!! Love it. It has so much life, if that make any since to any one but me.